For the second time in as many years, Mac maker Apple Inc. is awaiting the official nod from chip supplier Intel Corp. before announcing a brawny update to its Mac Pro workstations aimed at media professionals. The new systems will represent the first architectural overhaul to the Mac Pro family since Apple introduced the Intel-based Power Mac successor at its August 2006 Worldwide Developers Conference. They'll also be amongst the first machines from any PC manufacturer to employ chips from Intel's upcoming Penryn family of 45-nanometer (nm) microprocessors —specifically the upcoming Hi-k Xeons, which will be available in dual- and quad-core variants for workstations with front-side bus speeds of either 1333MHz or 1600MHz. Confirming reports filed by the Inquirer earlier this month, people familiar with the matter say the new Mac Pro line lineup will top out with an 8-core configuration that employs two top-of-the-line quad-core "Harpertown" chips. The top-bin Xeons, which offer the faster 1600MHz bus and 12MB of L2 cache, will start trickling in around mid-November at speeds of up to 3.2GHz. Apple, for its part, is ready to rock-and-roll with the new 45-nm Macs whenever Intel can deliver enough of those top-bin chips to trigger a manufacturing ramp. People familiar with the situation say Apple's end of the hardware is essentially complete, with builds having made their final pass through engineering earlier this fall. Availability now hinges on the Intel's capacity to deliver quantities of the new 45-nm Xeons, they say. Long-time AppleInsider readers will recall a nearly identical situation facing the Mac Pro last October. At the time, AppleInsider reported on Apple's plans to release its first-ever 8-core system —a Mac Pro sporting two quad-core Xeon "Clovertown" chips. Like Harpertown, the first Clovertown processors were slated for a mid-November release and (again) Apple's end of the hardware was similarly completed well in advance. The 8-core Mac didn't debut for another five months, however, as Apple held out for an exclusive 3.0GHz variant of the Clovertown chip while it waited patiently for Adobe to pull the trigger on its Intel-native Creative Suite 3.0 (CS3) software. 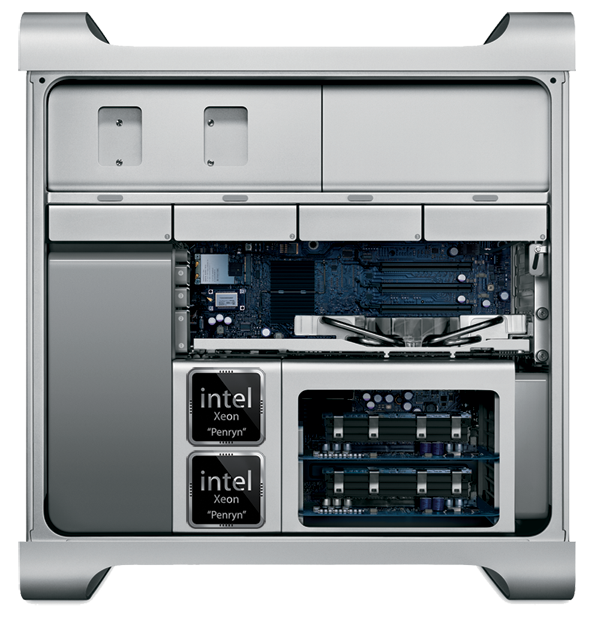 Following the release of CS3 in late-March, Apple in April finally rolled out the 8-Core Clovertown Mac Pro. With a warm reception to CS3 amongst creative professionals helping to drive sales of Apple's professional workstations in recent months, things are likely to play out much quicker this time around. The new 8-core Harpertown Mac Pro should debut anytime after mid-November and almost certainly by Macworld Expo in January. Speed improvements made possible by Intel's new 45-nm architecture are likely to compel large corporations to consider updating to the Penryn-based workstations. Speaking at Intel's Beijing developer forum earlier this year, Intel senior VP Pat Gelsinger said Harpertown Xeons will offer an approximate 45 percent speed increase for bandwidth-intensive applications compared to the Clovertown Xeon chips available in today's Mac Pros. Still, there is some slight uncertainty regarding precisely which Intel processor models will be used to progress the entry-level quad-core Mac Pros, which employ two dual-core Xeons rather than two quad-core processors. The multiprocessor, dual-core counterpart to Harpertown is "Wolfdale," which will be made available in models that support varying front-side bus speeds. A 3.16GHz low-power Wolfdale will operate on systems with a 1333MHz bus, while "normal" 1.86GHz and 3.33GHz models will work on machines with bus speeds of 1066MHz and 1333MHz, respectively. In addition, Intel also plans a 3.4GHz Wolfdale that runs on a 1600MHz bus like Harpertown. However this chip is somewhat pricey, with a suggested wholesale cost similar to that of the 3.2GHz quad-core Harpertowns bound for the 8-core Mac Pro. Therefore, it would seem incredibly unlikely that Apple would adopt the chip for the Mac Pro, as the 8-core Harpertown Mac Pro is expected to cost upwards of $4,000 itself. This raises the possibility that Apple's Penryn-based Mac Pro line will include models with varying bus speeds. This is not out of the ordinary, however, and was similarly the case back in October of 2005 when Apple unveiled its Power Mac G5 Quad and Power Mac G5 Dual. At the time, however, the system bus was automatically tied to clock speed rather than the controlling factor itself.